Back from my weekend spent with loved ones, it's time to look towards some new updates in the retro scene that should hopefully brighten up your Sunday. The first game we look towards is none other than a game called Ferrari Grand Prix Challenge, which first appeared on the Sega Mega Drive as F-1 Hero MD, and was then ported over to the NES and Gameboy. 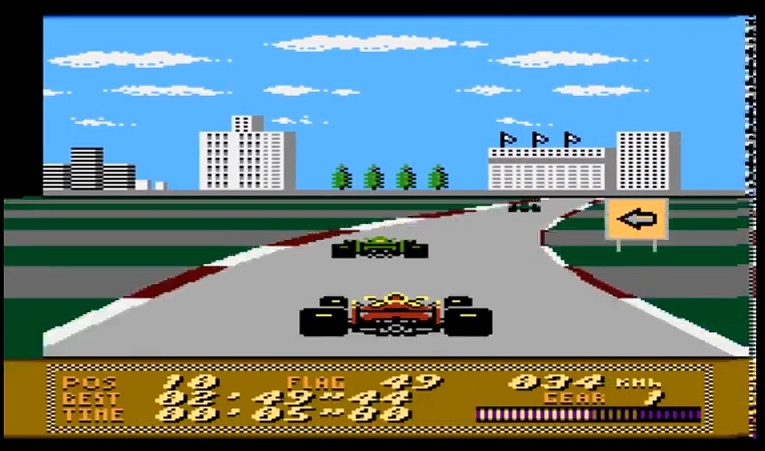 This game that allowed the player to practice up to six laps or qualify for every Formula One race in a behind the car view point, may well come to the Atari XL/XE as an unofficial port. Currently at a very early stage of development as seen by the preview video above, Ferrari Grand Prix Challenge is being coded by Gonzo with a current video showing a graphic screen in 6 colours (made for dll) + superimposed cars and a board, coloured with sprites. As for the negative side in relation to the flashing you see, is down to each frame of the route (there are 18 of them) decompressing. Although he does go on to say there may be a solution to this with the second bugger for graphics.